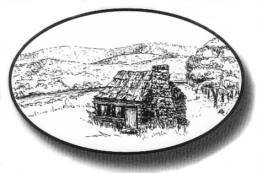 On Friday, February 1, the Barkhamsted Historical Society presented its first public program for 2002. 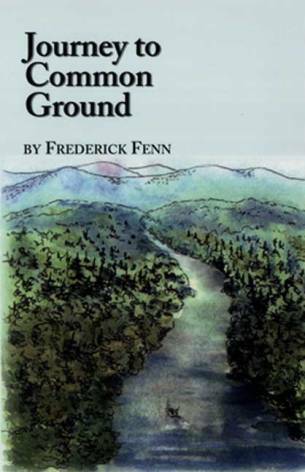 That evening, Frederick Fenn spoke about the process of writing Journey to Common Ground, which was recently published by Publishing Directions LLC of Southington, CT. This historical fiction work traces the lives of two Hartford settlers who marry in 1770 and set off for the "New Hampshire Grants" (later known as Vermont) to carve out a new life for themselves in the wilderness. Concurrently, the book traces the life of Umbarra, a member of the West African Ibo tribe who is taken prisoner and sold into slavery by the neighboring Oyo tribe at the age of 15. Eventually, the Connecticut couple and the captured West African cross paths. The true meat of the tale centers around how these three people interact with one another, forming strong friendships and helping one another. Though the story is a work of fiction, Fenn put five years of historical research into his novel. All the details surrounding the main characters' stories are authentic and the setting realistically and vividly described. This is Fenn's first novel and will be the first of a trilogy. Fenn is an educator who lives in New Hartford and works at The Master's School in Simsbury. But he grew up in Barkhamsted and retains close family ties to our town. The book jacket is illustrated front and back by his sister, Barkhamsted artist Linne Landgraf, who also drew that map that appears within the book. Fred and Linne were born in Springfield, VT. While many of their relatives still live in Vermont, their family moved to Connecticut in 1951. Fred and Linne's father, Raymond Fenn, bought land on Ripley Hill Road, built a road at the top of Ripley Hill Road and named it Fenn Wood Drive (later shortened to Fenn Drive). In 1952, Raymond Fenn built the house Linne and Fred grew up in, where their mother still lives. The Fenn children went to the Pleasant Valley school and to Regional #7. Fred followed his Barkhamsted education by attending Lyndon State College in Lyndonville, VT. Years later, Linne's children also attended school in Barkhamsted. I interviewed Linne and Fred recently about the process of writing and illustrating this novel, as well as some of their other interests. Their responses follow. Q. Can you give me a brief career synopsis? Fred: After graduating from Lyndon with a degree in Behavioral Sciences, I worked with mentally handicapped children in St. Johnsbury, VT, Lancaster, NH and then here in CT. I left public school teaching in 1996. It was at that point that I realized I wanted to pursue a career in writing historical fiction. I have mainly written in the historical fiction genre. To date, I have not had any other works published. I am inspired by reading the works of great writers such as Shakespeare, Wm. Golding, Hemingway, and Dickens. By writing I can immerse myself in research and then create a world where I can see, smell, taste, touch, feel and respond. Linne: Art lessons began when I was a child and continued more seriously after my children were in school in the 1970s' classes in oil painting, then in watercolor. I graduated from UConn with a major in botany, which required hours of drawing plant structures. Later on I became interested in pen-and-ink and began drawing illustrations for a mountain dulcimer newsletter and for my own entertainment. My favorite medium is watercolor and mixed-media watercolor with pen-and-ink. Colors in the sky and pieces of colors in shadows move me to take out my paints. I love to paint outdoors, but don't do enough of it. On the job, I illustrated articles for actuarial and financial consultants and also designed icons, CDs and newsletters for a software development team. Q. What other pursuits do you have? Fred: I play the bassoon and the Renaissance bass recorder. I enjoy playing in the pit (orchestra) on bassoon for Broadway musical shows. I also love working with Linne on either bassoon or recorder. [Fred's wife] Anne and I love wilderness camping and we camp on Lake Umbagog in northern New Hampshire with friends every August for a few days. We also love going to New York City and finding stuff to do, like museums and shows. Linne: In my other life, I play wooden flute, whistle and recorder in a contra dance band and also with a classical guitarist for receptions and other gatherings, playing Renaissance and Baroque music, as well as Early American and traditional Celtic tunes for dances. Fred and I also play as a duo and work together in musical events. Q. When and how were you first inspired to write a novel? Fred: I began Journey, in 1996 as a diversion and escape. I found I liked being transported into my own little world. Q. What came first: the story, the theme, the characters? Fred: The first piece was when Sarah had Caleb. Then Joshua appeared, then the story presented itself. Next Umbarra made his presence known so he, too, had a place in the story. Q. What was your process for writing the novel? Fred: I think it was Woody Allen who said, "80% of writing is simply showing up." The process first was showing up at my writing studio ready to work. Work meant either writing, re-writing, editing or researching and answering questions that came along as the plot and story lines unfolded. After the first incident involving Sarah, I wrote a basic outline that changed many times, but always it kept me from wandering too far from the main story. It kept me focused in those times of being overwhelmed, confused and discouraged. Q: At what point in the book's development did you do the illustrations? What were they based upon? Linne: After the early drafts were written, I began drawing illustrations for Fred's book from his description of the scenes, but I didn't see the book until after it was published. During the production period we decided to use two of these, a map and the back cover drawing. Fred and I discussed ideas for the front cover illustration and in the end I agreed to sketch an idea just for discussion. I was very pleased when his publisher accepted it over other submissions. For the final, I worked from photos and recall of the Connecticut River in northern Vermont, as well as from Fred's description from the book. Q. How do the themes of the novel tie into your life, interests and beliefs? Fred: The main themes of the novel are: friendship, struggle, loyalty and the belief that one person can make a difference in another's life. I feel truthfulness, honesty, living out personal beliefs through example, and preserving a man's/woman's dignity are seen in Joshua, Sarah and Umbarra. Each one is strong in his own way and each needed help at one time or another in life. We all are like that. I feel this way in my tutoring. Those students who come to me are there because they want the help. I encourage what is right and good in their work. We take the weaker points and strengthen them through various channels. In turn, I am uplifted by them. My students are the greatest. Q. What do you like best about the book? Fred: There are two places in the book where I feel deep emotion. The first is when Hammel tells Umbarra, "You ain't no real slave. You's just a pretend slave." No matter who is in charge of you on the outside, they can't change you on the inside unless you collapse or let them. We all are slaves to something in today's world. But, perhaps, if we analyze carefully, maybe we're only pretend slaves and in truth we are free. We only have to act, and allow ourselves to become free. The other part in the book I liked was the little wooden horse innocently waiting for Caleb to play with it again. "It did not know about the death." Q. Tell me about the next two books in the trilogy. Fred: The second book will begin in Vermont and end in Vermont, but in between, the story will take place in Paris in 1792' NOT a good time to be in Paris! The third book will center, I think, around the Civil War and, again, beginning in Vermont, ending in Vermont and the mid action will be in the Civil War. The time for this one will be 1863. I do have a cast of characters for the second book. There will also be closure for the characters of the first book. The third book has a first chapter and a few characters, but I have not truly gotten into the plot and story lines. I haven't met any soldiers, for example. Q. Do you have a timeline set for the next two books, or will you just take them as they come? Fred: I hope to have the second one in manuscript form by summer. The third one, I don't know at this point.